For reasons at least somewhat beyond my control, I was forced to take an unplanned hiatus from work last week. Clients were informed. Calls and meetings were cancelled. Deadlines were delegated or renegotiated. I was pretty much laid up, on the living room couch, on my back, all week. Not what I had planned, but what was necessary nonetheless. Contrary to my usual approach, I decided to make my hiatus complete. That’s how knocked flat I was. The “normal” me would have had my laptop on my lap – or at least by my side, my work phone forwarded to my cell and my cell phone ringing at all times, and stacks of papers to get through and work to be done. But I didn’t. I gave into my circumstances and took pretty much a total break. Now, stepping fully away from work can make me break out in hives. My overdeveloped sense of responsibility, coupled with my (I’m ashamed to admit) belief that I’m sometimes the best person to get something done, keeps me from easily stepping away. The questions fly into my mind endlessly – What if I’m needed for something? What if someone forgets something? What if a client needs me? How can I say no or not be available? Needless to say, nothing fell through the cracks. In fact, there are probably things that were handled more effectively without me sticking in my two cents. Clients were understanding; projects got handled. And the most amazing thing happened to me. By stepping back and taking a breather – even if it was forced on me – my brain recharged. I was able to see projects with a new eye, to come up with new approaches for clients and tasks, and to reignite my passion for our work – even though I didn’t know it needed to be reignited. 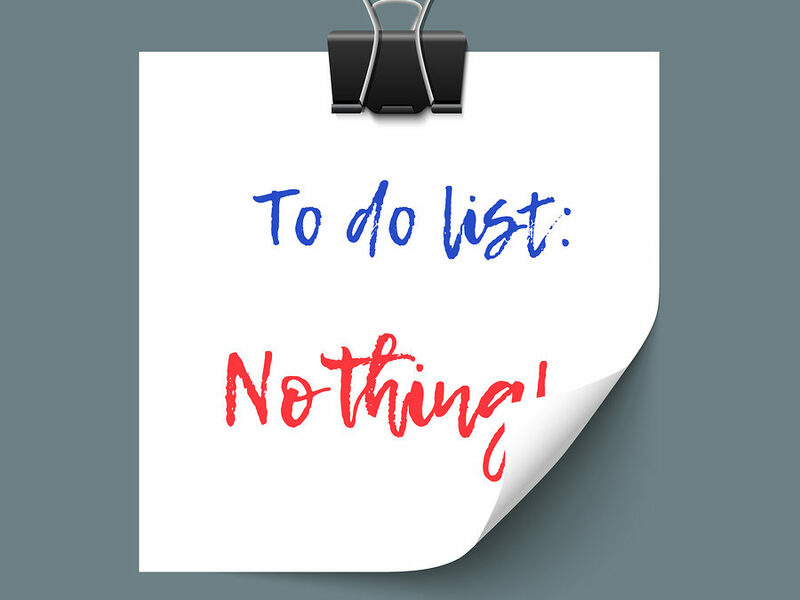 Bottom-line – there is a time to do nothing. To step back and take a breather. To recharge, refresh, and renew. I wouldn’t recommend a week on the couch on your back, unless you have to, but I would recommend making sure that you have space – from your work, your responsibilities, your leadership – even if it’s only a few minutes of space stolen in a day. Find a time and way to do nothing and enjoy your new outlook and enthusiasm when you step back in. What helps you do nothing? Where do you have to do more nothing? For support in doing nothing in a way that helps you lead more effectively, contact Lisa at lkohn@chatsworthconsulting.com.